Rare shared an update with the Sea of Thieves community regarding the upcoming development roadmap for the game. 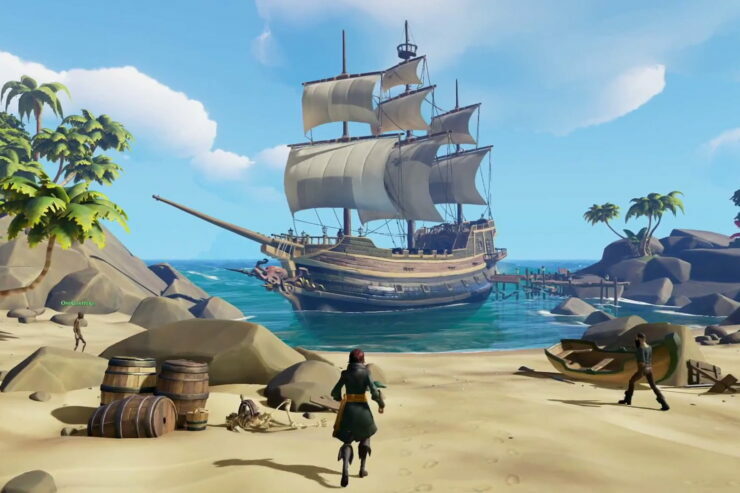 The developers have decided to put Pets and Ship Captaincy on the backburner to focus on adding more content to the game, which is one of the biggest complaints made against Rare’s title. Below you can find the details as well as a video where Rare developers discuss their plans. Our first content update, The Hungering Deep, will release in May and bring with it a new AI threat to the world. Crews will have to work together to discover and defeat this threat as part of a unique event. We will also be introducing a number of new mechanics to assist players on this adventure, and there will be unique rewards that players can earn as part of this event. Beyond this, we will begin our weekly events programme during May, where we introduce new mechanics and give players fun new ways to play with weekly events and rewards. In the summer months, we’ll debut two more content updates with Cursed Sails, which will include a new ship type, and Forsaken Shores, which will introduce players to a perilous new part of the world to explore. Similarly to The Hungering Deep, both of these updates will also include new gameplay mechanics for players, new AI threats to challenge and new unique rewards to claim. The appalling lack of content and features was among the biggest flaws we pointed out in our collective review, too. Sea of Thieves is a daring attempt by Rare but also a lacking one on so many fronts. While the graphics are fantastic and the game has a unique charm, ultimately the world feels empty, devoid of content and features. Sailing with friends can be an exhilarating experience at first, but when there’s not much to do the fun dies down pretty quickly.